Space Whale – A Celestial Creature for D&D 5th Edition! 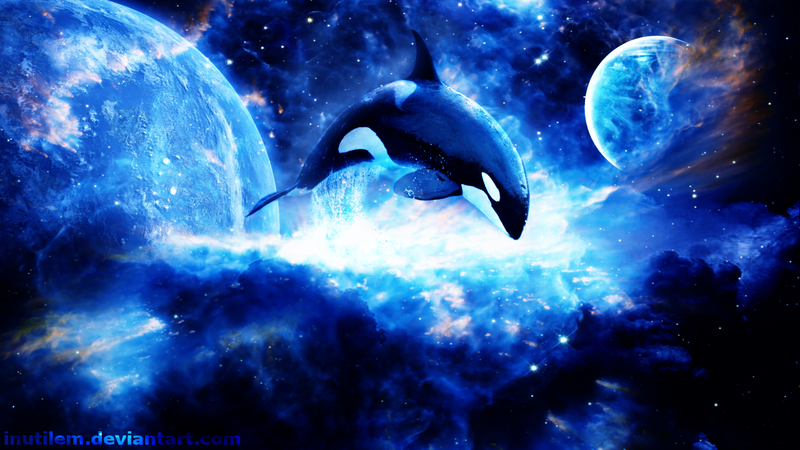 Floating within the bounds of wildspace, one can spot what looks like a whale or an orca. As if through divine power, it glides through the boundless reaches as if it were an oceanic current, all without touching the Phlogiston that so many spelljammers require. However, this isn’t the only place to observe them. Many dwell within the layers of the Beastlands, for they are at home in both the water and the air. Others find ways through their master’s demiplane into the Elemental Plane of Water, as well as of Air. Sometimes, one can be spotted in the Elemental Plane of Ice as well. In fact, there has been an allegiance forged with Ben-hadar and Chaan, the Good Archomental forces of water and air. Many other planar creatures have various levels of respect for them. The free celestials of Arborea, The Eladrin, have even ridden them into battle in some instances. However, the Devas and Angels of more lawful planes think lowly of them. Among deific powers, the Master of the Pod is a lesser power. However, its message is familiar to many, through acts of joy and freedom. While known for discouraging battle, the Cosmic Coki inspires courage and virtue in the heat of conflict. In some cases, this can mean sparing even the most vile of enemies. Despite rumors, Coki isn’t actually a Beast Lord, despite their demiplane orbiting by The Beastlands itself. In a similar vein, the Celestial Pod aren’t truly native to said plane either.